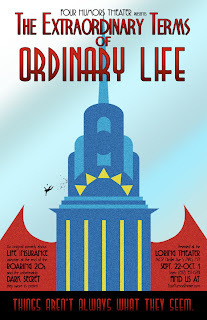 The Extraordinary Terms of Ordinary Life is a wacky, off-beat comedy, which seems fairly typical of Four Humors Theater. The other Four Humors show I've seen is the new original rock musical The Age of Wordsworth - the life and words of William Wordsworth set to rock music. This show really is nothing like that, but they are similar in that both are pieces created from unique and original ideas that really evoke a sense of time and place. 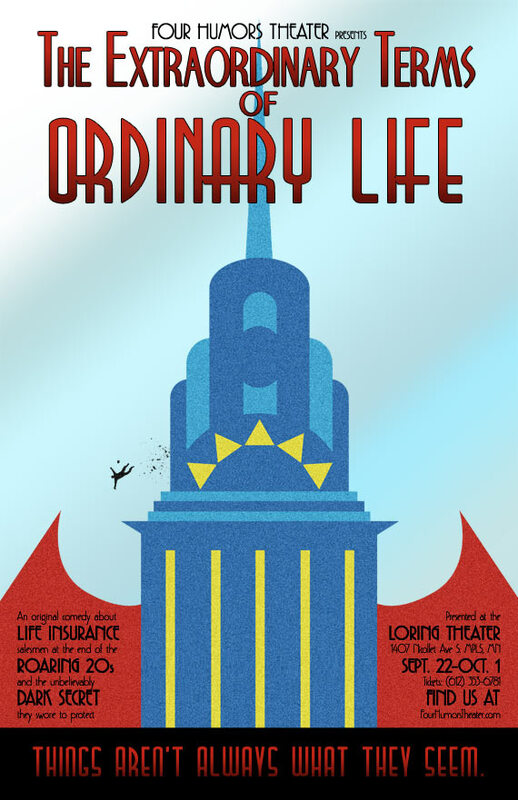 The time and place of The Extraordinary Terms of Ordinary Life is a life insurance company in Manhattan in 1929, just before the crash. The play was written by Ryan Lear (who also directs), inspired by some old life insurance training manuals he found at a garage sale. A band playing jazz standards of the time helps set the mood, and the Loring Theater is a perfect venue - it's an old vaudeville theater built in the 1920s. The set pieces are cartoonish skyscrapers, with a nifty backdrop of the skyline of NYC. The whole thing put together almost feels like watching a silent film from the era, with exaggerated facial expressions and gestures and broad physical comedy. John Davidson (the adorable Andy Rocco Kraft who's adept at the physical comedy) moves from a small town to the big city in response to an ad from the "Good Old Life Insurance Company." Naive and enthusiastic, he believes he could be "the man." He's immediately hired by the head of the company (Alisa Mattson, who also plays his wife, who it turns out is really the one in charge). The experienced salesman Frank Engles (the fast talking Ryan Nelson) takes Johnny under his wing and teaches him how to sell to anyone. Johnny soon becomes a big success, and falls in love with the sweet girl in Accounts Receivable, Mary Southworth (Rachel Petri), who has dreams of becoming a salesman like her father. Rounding out the cast are Kat Wodtke as a creepy old man who eats paper, and the clowns Garret Vollmer, Mark Rehani, and Jon Mac Cole playing multiple roles (and harmonizing on the company theme song). The Extraordinary Terms of Ordinary Life is a wacky, fun, at times inexplicable look at a time when the economy was booming, until it all fell apart. Sound familiar? Only in this world we learn that the reason the economy tanks is because the bankers are storing up gold to feed to angry demons to keep them from eating the entire human race. Huh? Oh well, it's about as good of a reason as any others I've heard!